A large and strong "open top" bird cage suitable for most large and medium sized parrots. Stand is NOT included but it is available as an optional extra, see bottom of screen for details. - Super Value for money. Exceptionaly high strength cage without the high price. - Thickly wired for most large parrots. - Cup holder design prevents parrots lifting up cups spilling food. - Doors to feeders are lockable with clips to help prevent parrots lifting the doors. - Package includes: 1 x cage, 2 long perches, 1 perch for roof top, to metal cups. 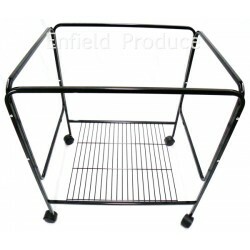 - Stand NOT included but is available as an optional matching stand with wheels.